What are the differences between Checkpoint Systems and Alpha High Theft Solutions 1 alarm, 2 alarm and 3 alarm solutions? The following is a brief explanation of the Alpha High Theft Solutions 1, 2 and 3 Alarm products functionality. 1,2, and 3 alarm solutions encompass individual and combined security solutions for whatever your loss issue is. The functionality begins with our Alpha 1 Alarm device and it will activate the Checkpoint Systems Electronic Article Surveillance antenna if a breach occurs. The Alpha 2 Alarm device has added security that in addition to activating upon breach it will activate if the device is cut or even tampered with. The cable is coated and made from aircraft strength cable for extreme durability and reliability. The coating on the cable not only protects the merchandise from theft but protects it from the device. For our most complete device the Alpha 3 Alarm Includes the same as 1 and 2 alarm actions, activation upon breach and activation upon tampering or cutting, It also will continue alarming with an extended range protection at 95 Decibels for up to 10 minutes after shoplifter has left the premises. The standard decibel is a ratio of how much acoustical energy we hear with and for human conversation is 35 to 45 DCB. 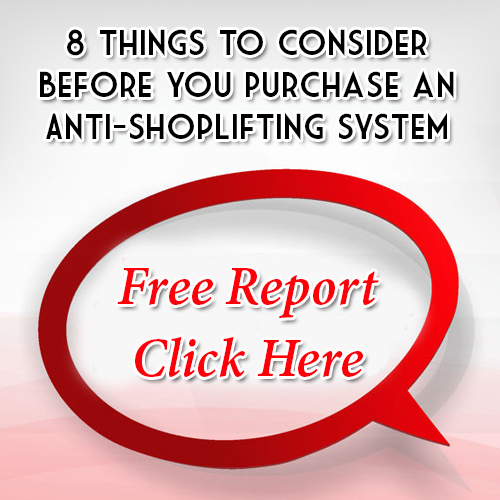 This technology provides an extra piece of mind when added to your security solution to stop shoplifting.